Guys… shhhh… don’t tell Aldi. But, there’s some competition for my heart. Enter: Lidl. It’s liiiike Ikea meets Harris Teeter meets Costco meets Aldi. And it’s good. Really good. Maybe not better, but change is nice sometimes. The closest Aldi is 8 minutes from me, and the closest Lidl is 25 minutes, so although geographically, it would seem that Aldi would be the clear winner of my affections, the comparison leaves things a little shadier. Aldi – excellent inventory of private label options, snacks, nuts, and dry goods. 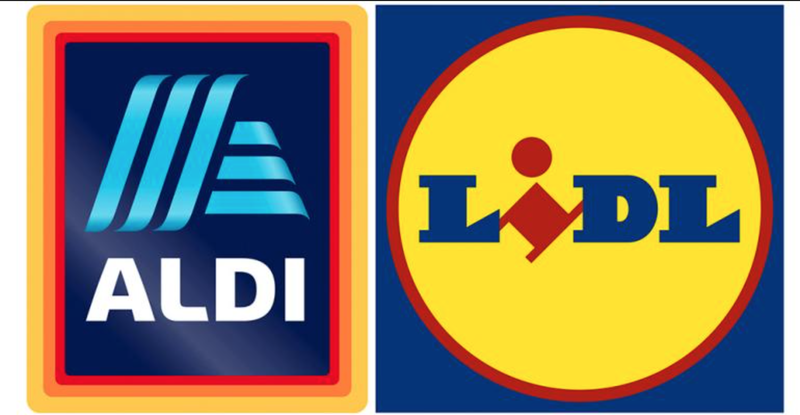 Lidl – excellent inventory of meat, dairy, wine and name brand goods. Plus they have a bakery, clothing, and makeup. Winner: Eh. It depends on what I’m shopping for. It would be rare that I could complete and entire week’s worth of shopping without needing to supplement from a more traditional store. But. I’m going to give Aldi the nod here, because as much as I love all of Lidl’s offerings, there are some key things I felt were missing, and despite what some people think, I’ve found Aldi’s meat to be really good quality. Lidl – excellent rotating discounts (see prices listed above). They also print out coupons on their receipts (or at least are right now) for $5 off $30. Aldi gives coupons at their grand openings but not on a regular basis. Winner: Sooo close, but the receipt coupons are going to give the edge to Lidl. Aldi – I sort of loved the grunge effect of Aldi’s old layout. It made me feel like I had some street cred… as much street cred as one can achieve doing suburban grocery shopping. Their new layouts are lovely. They keep the authentic Aldi feel (if you shop there, you know what I mean… stacked boxes, bread crates…) but in a proud, elevated new way that shops more like a traditional grocery store. Lidl – Lidl is bright, laid out like a “real” grocery store, but then has an awkward set of mini-aisles full of German clothes (that I have been tempted thrice now to try) and housewares. Winner: Going with Lidl here, though I’ll need to visit a couple more times to get truly used to it. Listen, I’m partial to Aldi here, but for the general shopper, Lidl is friendlier and more familiar. Overall winner: It’s been tempted and tested, but my heart belongs to Aldi. I really love Lidl, and it will certainly become a stop in my rotation, particularly for their Rioja wine and selection of meat, but even if Lidl were closer, I’d pick Aldi on a more regular basis. It will be interesting to see how these grocery wars play out, because these frenemies are giving shoppers a lot to be excited about. I’ve shopped Lidl three times now… the first, just to scope it out. I grabbed a couple of things but had already done my shopping for the week. The next time I shopped it, I was getting things for one of my clients’ free pop up farmer’s market in an at-risk community in Charlotte. I purchased 40 lbs. of chicken, 18 half gallons of milk and 18 loaves of bread for… $50.05. Finally, I went back for a fuller weekly shop for our family. I had two $5 off $30 coupons that I didn’t want to go to waste. Unfortunately, you can’t stack the coupons (so $10 off $60), which is a real pet peeve of mine, so I split my order in to two transactions in order to redeem both. Below is a look at what I got for $83.64 ($93.64 before my coupons). Greek yogurt – $0.40 ea.